1.1 What Are These Upgrades? I have received a lot of questions from my friends and other paintball players regarding the best Tippmann A5 upgrades. Although there are thousands of possible upgrades and modifications you can make to the Tippmann A5 here, I am going to discuss the best Tippmann A5 upgrades which will help you get ultimate performance with your paintball gun. Paintball sport is a war-like kind of sport where opponents shoot at each other with balls of paint. The outer surface of the balls is fragile and it breaks on impact. Once the ball bursts, the person shot with the ball is splashed with paint. Today, most of the paints are food grade and safe to use. And that every aspect of safety forms the basis of paintball shooting which explains why today, this is a very sought-after sport that enjoys multi-channel uses. A complete environment is prepared and combating parties use their weapons to shoot at opponents. One of the ways to improve the quality of a game is by upgrading the weapon. By its utility, there is no alternative to Tippmann A-5, it is also very adaptable to open market accessory makers. That is why there are a huge number of upgrades to this weapon available in the market. In this post, we will highlight a few top upgrades that you can take advantage of to take your game to the next level. One of the best features for Tippmann A5 is its patented cyclone feed. It creates a vortex to deliver paintballs to the firing chamber. In itself, the cyclone system is a huge boost to the supply and an upgrade here makes the flow of paintballs nearly continuous. The upgrade to this cyclone feed increases the supply of balls by a huge margin. You can imagine the speed of firing that is possible with the increased supply. Accompanied by the trigger upgrade, the feed upgrade is a real winner. We also mentioned briefly about the trigger upgrade, and we can discuss it now in detail. The trigger upgrade has a double trigger attachment. The upgrade also has an electronic kit accompanied with it. The kit has a latch lever you use to adjust the rapidity of firing. It can be fully automatic, semi-automatic or safe. The best part of this upgrade is that whether it is accompanied by an upgrade in the feed mechanism or not, the trigger works just fine. An addition of this upgrade is also the change in trigger design. Rather than offering a slot for a single finger on the trigger, the upgrade allows two fingers on it. This is a visible change. Internally, the residual air pressure of the earlier shot is used to reset the lever and so the balls are replaced for next shot much easier. The better the reset mechanism, the better is the replacement. To control the speed, return pressure of the shot is adjusted. This upgrade can work in tandem with the cyclone upgrade. If the cyclone upgrade is not a very fast one, this upgrade can be adjusted to manipulate the speed. And the other is also true, where the trigger upgrade supports the high speed of cyclone upgrade. Next, are the barrels. Your shots are now prepared. You have faster supply as well as faster upgrades to speed up your shots. You are already ahead of the competition and now, when they try to run away, aim at them from far. To increase your range of the shot, use a flatline barrel upgrade. The barrel absorbs the impact of compressed air used for shots and steadies the shot a little more. With this upgrade, your shots go farther and steadier. You even add fifty yards more to your shot. In the bigger terrain playing arena, this extra range helps a lot. What about the piston push? Earlier compressed CO2 gas barrels were used to shoot the balls. This had a temperature issue. At low temperature, the liquid CO2 often would not convert to gas. This resulted in jamming of the piston and shots froze. When CO2 tank is replaced by compressed air or pressurized nitrogen this issue of jamming of shooting piston is completely removed. You are sure that your shots will not jam. There are barrels of compressed nitrogen as an upgrade. We discussed the upgrades keeping average needs in mind. We discussed the Flatline barrel. It is adequate for every small range of battleground. The barrel covers a medium range ground sufficiently. If you plan to work with long distance shots, and often needs to cross high obstacles in the game, a Sniper barrel may be the most appropriate. It really depends on the need. If you are planning to upgrade discuss with the retailer or talk with a veteran of the game. Similarly, the CO2 has its admirers. The smaller, faster firing for short duration is fine with them, though the complete gaming scenario is leaning towards the compressed nitrogen upgrade. If you are gaming in summer, CO2 can be a regular choice. However, in special combat-like situations, it may not be the most searched one. If you are not planning to be seriously competitive with your paintball marker, the combination of upgrades for both the paintball feed and trigger is an excess. One of them can speed up your shooting sufficiently. The cyclone upgrade for feed is sufficient to increase the rapidity of your shots. Or with the patented feed system in the basic marker, a trigger upgrade is enough to speed up the shots for regular paintball games. However, in a combat or high-intensity game, it is better to add both the updates. You never know what your opponent brings into the game and it is better to be well prepared. The E-grip trigger is a very supportive trigger mechanism. It smoothly changes between modes and easily fires a good load in auto mode. If the combat scenario that you are in, is a long drawn one, successive rapid bursts can deplete your balls fast. See if you really need those rapid bursts and then only plan your E-grip. Remember, there are a few more cosmetic upgrades to this machine. The barrel grips and the viewfinder are some of them. These are very specific need-based upgrades. Even for the top-level gamers or combat specialists, such upgrades are situation specific. They do not use them frequently and for all purposes. If you plan to buy anything that has a one-time use, think twice and search for a multiutility replacement for it. Buying specialized support gives you a few bragging points but the decision may not be that intelligent. Talk with your retailer, even if you are an old hand in the game when you plan to buy such specialized equipment with limited use. They may have some smaller, cheaper and multi-use alternatives for you. 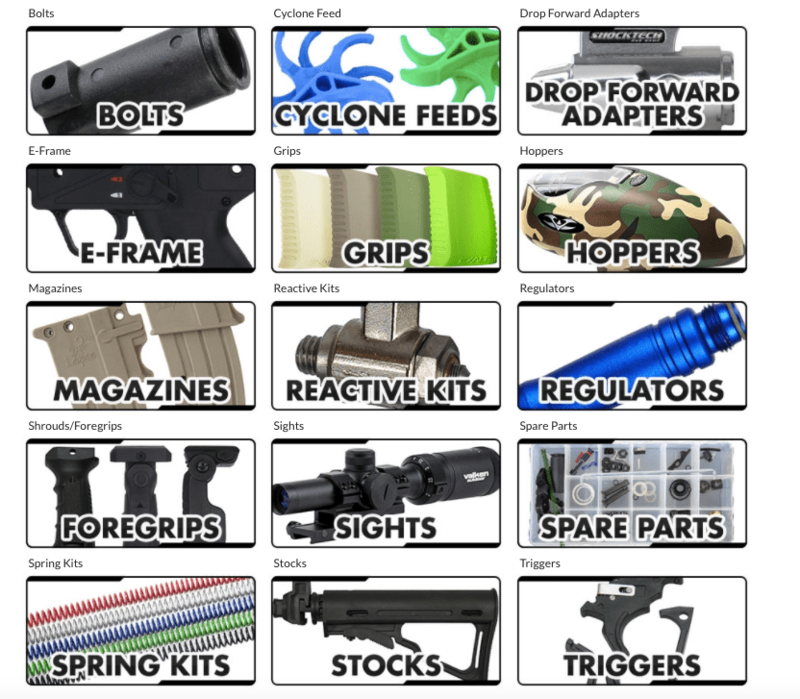 These are the best Tippmann A5 upgrades that will help you make the most out of your money. With these upgrades, you can give the same look to your A5 as of any military style weapon out there, for example, UMP AK-47, MP5, AR15, and M4, etc. Previous Article How to Fill a Paintball Pod Correctly? Next Article Planet Eclipse GTEK Review: Is it worth buying?